Homecoming arrives on Buffalo State’s campus this week, offering a number of events for students, parents, faculty, staff, and alumni. 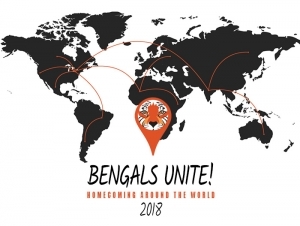 The theme of this year’s homecoming is “Bengals Unite, Homecoming Around the World,” and features several new activities, including a student pre-game tailgate party before the Bengals game against the Hartwick Hawks on Saturday, September 29. Tailgating will be held in Lot G-24 at 10:00 a.m., followed by the game at noon. The idea of hosting a tailgate party came from student feedback, said Daniel Heims, associate director of New Student and Family Programs. “It’ll be a cool atmosphere for students to hang out,” he said, noting that the tailgate will feature food and music. Homecoming events begin Sunday, September 23, with window painting in the residence halls and banner painting in the Student Union, and conclude on Sunday, September 30, with a "Sunday Send Off" in the Campbell Student Union. Monday, September 24, 7:30 p.m.
Homecoming Week kicks off with a free movie in the Performing Arts Center at Rockwell Hall sponsored by the United Students Government (USG). Admission for Buffalo State Students is free with ID. General admission is $5, and tickets can be purchased online. Tuesday, September 25, 7:15 p.m.
An ensemble composed of alumni from Buffalo State’s Music Department will perform. The recital is free for the public and will be followed by a wine-and-cheese reception. Thursday, September 27, 12:15 p.m. Along with the pep rally, students can partake in a free barbecue lunch provided by USG. There will also be music and giveaways. Friday, September 28, 3:15 p.m.
After the Car/Truck Float Competition, the homecoming parade will start at the Burchfield Penney Art Center, travel through the Elmwood Village and end on campus at The Plaza for a post-parade party. Saturday, September 29, 8:00 to 9:30 a.m. Scholarship recipients, donors, and families will celebrate Buffalo State’s scholars and their benefactors. Tickets: $5 available at the gate. Free for Buffalo State students with ID. Saturday, September 29, 6:00-10:00 p.m.
Games, prizes, food, fun. and music. Celebrate Homecoming 2018 in the Plaza (Union Quad) and Perry Quad. View the full homecoming schedule.